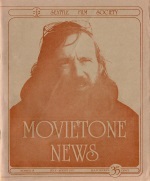 Beginning in this issue, and continuing whenever occasion warrants and space permits, MOVIETONE NEWS will include a retrospective quickie or two among the normal short notices on current cinema. In the past MTN writers were able to comment on older films only in advance of seeing or reseeing them—that is, as part of our regular service on the local repertory houses, You Only Live Once. While we intend Quickies to continue emphatically along lines already established, we hope in this small way to quietly insist once more that a movie is a movie is a movie, and that the cinema is eternally in the present tense. —Ed. Jean Renoir, son of the great painter and a great artist in his own right, is—by temperament—somewhat at odds with the naturalism of Emile Zola, though he has twice made highly regarded films from books by Zola (his second film was Nana, 1926). But his modernized La Bête humaine is proof that Zola could be an inspiration as well as a cogent and productive challenge to both the generosity and the irony in Renoir’s libertarian vision. The film’s modern setting gives the naturalist’s deterministic psychology a special twist: Renoir’s people here are heirs to Zola’s, and yet as selfconscious and self-aware moderns living in the age of psychoanalysis, their applications of deterministic views to their own lives restates the problem in a newer and even more challenging way. When Gabin and Simon embrace in the rain, the embrace is undercut by their haunted (and separate) gazes: they are already anticipating the destiny which their fatalism nourishes. The compassionate direction of the performers and the use of the camera as a discreet and tolerant observer at windows or doorways and in rooms looking into other rooms mark this as a Renoir film—as does Renoir’s own unabashedly animated acting in the role of the unlucky Cabuche. But the subject and, one guesses, Zola have also pushed Renoir in directions that prove fruitful somewhat although uncharacteristic of his admittedly varied career. La Bête humaine is an unusually somber film for him, even when viewed alongside his elaborate despair in La Règle du jeu (made the next year), and its imagery, in keeping with the demands of the subject, is uncommonly bold and dynamic. Most important of all, the film’s particular chemistry produces striking results in its use of machine and nature imagery. Unexpectedly, Renoir proves every bit as responsive to machinery here as he has always been to nature. Instead of using the one in contrast to the other, he uses both as extensions of human psychology. In the scene with Flora, where the two kinds of images are explicitly mired, it is the passing train (and, surprisingly, its apparently refreshing breeze), not the river, which diverts Jacques’s murderous impulses. Even in their leisure hours, the characters seem drawn back to the railway, as if it were life itself, and Jacques explicitly views his locomotive as a means of getting closer to, rather than conquering or evading, nature. The river of life, an image that occurs frequently in Renoir, has been replaced here, ultimately, by the railroad, and the result is a powerful sense of ambivalence and irony directed toward human nature itself. But perhaps the most touching manifestation of this heartbreaking mixture of compassion and viciousness comes from Sévérine, who seems to grow warmer, more moved and more moving, as destruction comes nearer and resignation becomes total. The film’s strongest connection with the generous libertarian side of Renoir’s work comes through the character of Pecqueux (played by Julien Carette). Pecqueux has a wife in Paris and one or more lovers and perhaps even a family of sorts in Lyon; the wife knows all about Lyon, accepts it goodnaturedly just as Pecqueux says she does, and meanwhile is party to the love affairs of Lyonnais railroaders who need momentary privacy in Paris. Pecqueux is the center of a spirit of openness and flexibility which quietly runs counter to the more rigid and destructive behavior embodied in Lantier (Gabin), Sévérine (Simon), and Rouband (Ledoux). Screenplay and Direction: Jean Renoir, after the novel by Émile Zola. Cinematography: Curt Courant, Claude Renoir. Music: Joseph Kosma. The Players: Jean Gabin, Simone Simon, Fernand Ledoux, Julien Carette, Blanchette Brunoy, Jacques Berlioz, Jean Renoir.